The patterns in this book are really lovely, and it's so interesting to see pictures (albeit tiny ones) of the original inspirations from the 1940s and 50s. There are several patterns I would love to knit once I feel comfortable with my knitting skills. This is a book I would probably buy down the road, once I am a more advanced knitter.I didn't really like how the pictures were all in the front of the book, and the patterns in the back. I'd rather have them side-by-side. Just a small complaint. A very beautiful knitting pattern book to look at, with great pix and detailed instructions, but of little use to anyone (like me) who happens to be a larger size than 40 inches, alas. Consists of updated patterns from the late 1940s and 1950s mainly for sweaters (a lot of cotton) plus one pair sox, a scarf, and set of mittens. Also has several camisoles that are rather nice, if skimpy, and not as twee/cutesy as some of that sort of pattern seems to be in style lately, and a bit of history of the original patterns, also with pix. A good book, and I did want to make a couple of the patterns as they are mostly quite simple to make and classic in design (my favorites) but with interesting stitches used; unfortunately the small size ranges made that impossible. Overall, a good knitting pattern book for those who enjoy vintage styles. 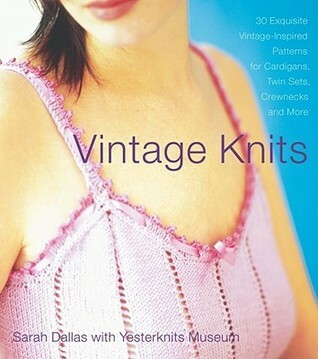 Sarah Dallas created knitting patterns based on 40's and 50's knitwear. They are not original designs, as such, but they are nice to look at and beautifully photographed. However, the patterns leave a lot to be desired. Most of the instructions are missing. As someone who has written out the instructions for a cardigan, I can tell you that it cannot be done in the one and a half pages Sarah has written. It's too bad, because this could have been a terrific book. Look at the pictures, use the lovely colors (the yarn is discontinued), and go get a real pattern. These are gorgeous patterns, but all in almost miniature sizes. I'm using the basic idea for a sweater, but am modifying the size significantly to be able to actually wear. I think if you treat this book as design ideas and a fun math puzzle book (i.e., if my gauge is this then goal is this many decreases over this many rows) you'll be quite satisfied. I love a lot of these patterns. They are vintage (with side by side photos to prove it) and have vintage appeal, but don't look costume-y or that special sort of ugly that only "it's vintage!" can provide. A few simple but classic patterns I will revisit when my skill level is up. This book includes some uncommonly pretty projects and has very easy to understand patterns. I love the idea of modernizing vintage classics; this book does it best of what I've seen! Oh, and I'm absolutely in love with the diamond stitch sweater! somewhat vague instructions (make sure you know how to reverse shaping and increase/decrease in lace on your own before you try using this book) and limited size range but gorgeous patterns. There was very little in this book I could make for anybody I know as every thing was sized for very small people. Everything in this book is meant for a really tiny gauge-- it would take me 85 years to knit a sweater from this book.